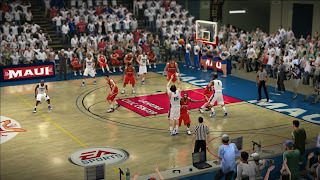 When it comes to sports video games there are two camps, EA and 2k; I have to admit I am very split between the two. 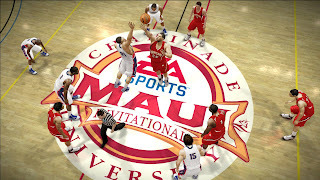 With EA I am (was) a huge fan of Madden, NCAA football and MVP baseball (RIP) and with 2k I am (was) a huge fan of NBA 2k, The BIGS and College Basketball 2k (RIP). 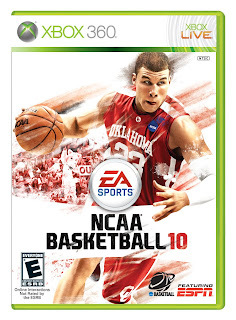 But 2k has dropped out of the College Basketball game so I was left with EA’s version. EA has made some very promising strides in the presentation and gameplay since I last played the series (2008). Having an ESPN and CBS broadcast is a nice touch, having two different broadcast teams and the different TV presentation is really cool. During a season you can simulate a game using GameCast, which allows you to see the progress of the game and even jump into the action if your team isn’t faring well. The gameplay really captures the energy of a college game and the in game animations are really sharp. However, there were still some areas where I wasn’t as impressed. Playing NCAA football and Madden, I always notice a different feel to the gameplay. 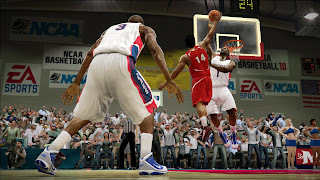 This, however, is not the case between NCAA basketball and NBA Live, were the gameplay is almost identical. Overall I wasn’t blown away by the game but at the same time elements to the game that make it fun to play. I give this game 7 out of 10, but with a few changes in the gameplay to set it apart from NBA Live and a more dynamic recruiting element (like what they do with NCAA Football) this could easily be a 9 out of 10.